Space Safety » Archive » Space Exploration » Space Colonization » Living In Space 3: Asteroids, Friend or Foe? Warning sirens blare throughout the station – red lights flash and alert the inhabitants of the incoming danger. Solemn glances are exchanged in the control room, and the view screen fills with the image of a massive chunk of rock, headed directly toward the colony. The smaller rocks hit first; holes are smashed into the glass encasing the habitat, sending a rain of broken glass into the orbital home. The habitat starts to vent its oxygen, just as the asteroid collides with the cylinder. A plume of fire and metal expands where the colony once stood. Sound familiar? Sci-Fi would have us believe that the inevitable end result of almost any space colony is a fiery explosion brought on by a massive asteroid collision. But how likely is it that a colony would face this sort of destruction, and is there anything that could be done to avoid it? This week on Living in Space, we take a look at our neighbors in the solar system: Asteroids. NASA’s NEOWISE program in 2011 was used to detect asteroids over 330 feet. Each dot represents an asteroid, with the green dots representing the inner planets. 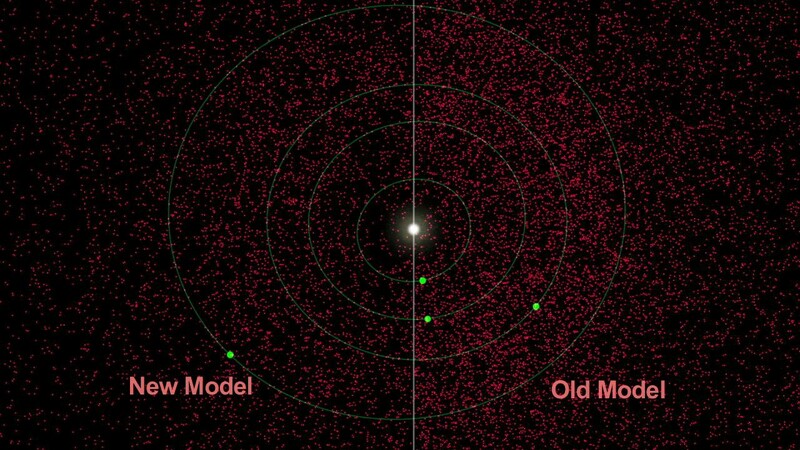 NASA estimates over 19,000 such asteroids in our local area, the image compares NASAs old model of NEO detection with its new, NEOWISE, model (Credits: NASA). A sphere of debris surrounds Earth, both the man-made satellites that clutter our skies and the thousands of asteroids and comets that swing close to the Earth. We refer to these as Near Earth Objects (NEOs). NEOs are one of the most useful, valuable assets available to a space colony – they are filled with vast mineral riches, more than enough to fuel a spacefaring civilization for eons. They also constitute a serious threat, not only to any future space colony, but to Earth itself. One finds that in order to be struck by a meteoroid of really large size, one ton, a large ‘Island Three’ [O’Neill’s proposed orbital colony] community would have to wait around a million years. Such a strike should by no means destroy a well-designed habitat, but it would certainly produce a hole and cause local damage. While one could call O’Neill’s predictions of the colony’s sturdiness optimistic at the least, his examination of the data available to him is relatively sound. He goes on to say that high velocity, high frequency impacts would be a far greater concern, stating, “…there’d be a strike by [a small tennis ball sized meteoroid] once every 3 years.” The reason for the small number of impacts stems from the relative remoteness of the habitat’s potential location: far enough away from Earth and the Moon’s gravity wells that most meteoroids would be swept away by their respective masses. Much of the data O’Neill worked with has been supplanted by more up-to-date information. The new data is significantly less optimistic, with smaller impacts happening once every year or so. Although these tennis ball sized impacts still pose a large risk to the colony (jamming the rotation motors, smashing radiation shielding or the solar arrays, even puncturing the habitat itself), the relatively low frequency of these impacts, coupled with compartmentalization and proper safety polices, these risks are manageable. While Hollywood would have us believe even the smallest puncture in the outer shell of a space station will instantly lead to a massive decompression event, the reality is that on a reasonably sized colony, it would take months for the atmosphere to leak out. Some data suggests that a habitat at L5 would be safer with respect to asteroids than a station orbiting the Earth, considering that the massive gravity wells of the Moon and the Earth pull the vast majority of all debris toward them. Any habitat sufficiently outside of Earth’s orbit will not have to contend with the barrage of man-made debris either. Finally, the development of specialized radar equipment and anti-meteoroid systems could nullify the risk posed by all but the biggest asteroids – and even those would not pose an insurmountable challenge to a well-designed colony. For those reasons, the construction of a colony in space would by necessity lead to an expansion of our planetary defenses as early industry establishes itself in Earth’s orbit. Space-based sensor arrays would be a requirement on any large colony, and these would collect endless reams of data on asteroids, both big and small. This – combined with the relative ease with which a colony could construct and conduct an asteroid-capture mission, would almost completely negate the risk to our civilization by a large asteroid impact. Currently Earth is a sitting duck with barely a single percent of space funding being put towards a planetary defense system. While the worst case scenario of a massive asteroid colliding with a colony makes for good TV, the reality of the situation is that we have far more to benefit from these massive rocks than we risk. Asteroids are almost certainly the answer to many of the problems we are currently facing as a civilization. In the near future, much of the resources we rely on for our current level of development will begin to dwindle. This can be offset by advances in technology, recycling, and other measures, but sooner or later, humanity will run out of these materials. Luckily, high above us floats a treasure trove of vast riches, just waiting to be exploited. 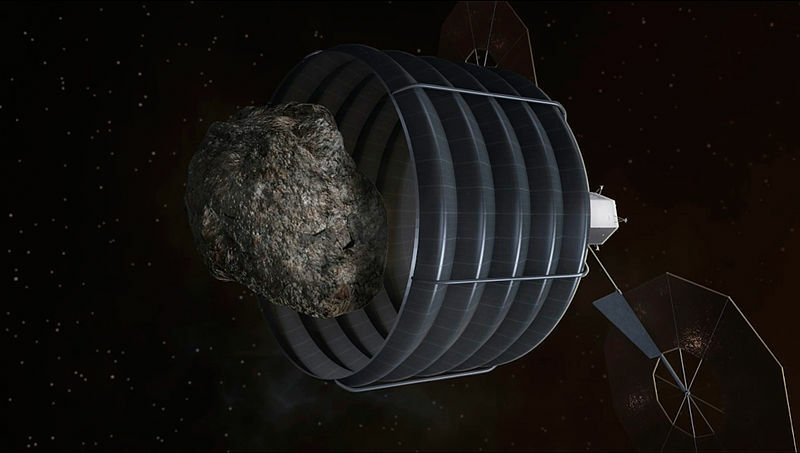 Rendition of a possible architecture for capturing an asteroid as proposed under NASA’s Asteroid Retrieval Mission (Credits: NASA). Even some of the smallest asteroids we observe contain many tons of raw materials, the combined total material mass of even just the closest, most easy to reach NEOs is unfathomable, many times more than the Earth’s reserves – take the oft mentioned asteroid 1986 DA, containing over 10 billion tons of iron, a billion tons of nickel as well as ten thousand tons of gold. Colonies in space would allow us to quickly and easily capture and mine these space rocks, providing us with an ample supply of materials not just to fuel the Earth’s constant need for them, but also to expand industry in space. Currently if we want to build a space station, or a solar power plant, or any other large scale project, the materials have to be constructed on Earth and sent into space bit by bit, using an exorbitant delivery system that hamstrings any real meaningful development of this new frontier. If a single colony were to be established in space, this would become a null point. 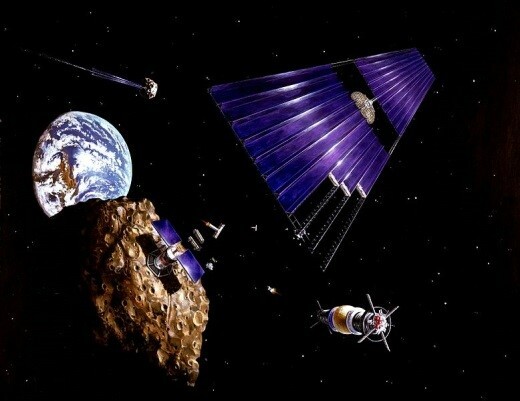 A structure in space would be able to launch missions to retrieve asteroids with relative ease, bringing the rocks to the colony for processing, or mining them in-situ via relatively traditional mining methods or more advanced methods, such as magnetic rakes or heat treating the rock. Currently, several groups and corporations have proposed mining operations. Planetary Resources plans to create a fuel depot in space by using water extracted from asteroids, Deep Space Industries aims to begin mining by 2023, and NASA has been investigating several different methods for determining if asteroid mining is profitable. Recently a group of astronomers at Strathclyde have determined a number of asteroids as EROs, easily retrievable objects. Artists impression of a solar panel array built from asteroid materials. Such arrays could provide unlimited clean energy to the Earth, using microwaves to transmit vast amounts of power from space (Credits: NASA). Many of these plans attract a great deal of skepticism and rightly so: asteroid mining will almost certainly never be a profitable venture when the mission has to overcome Earth’s gravity first. 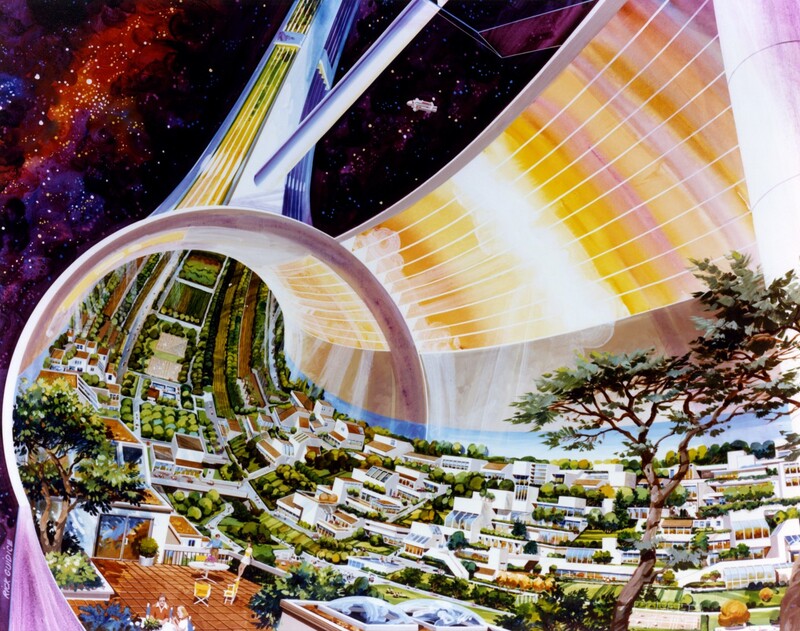 But the establishment of a colony will see the cost of retrieval plummet and provide a place for workers and skilled engineers to live while they process the raw materials of an asteroid into new structures and usable materials. All of the pie-in-the-sky designs and plans we so often hear about would be completely within the realms of possibility. Large scale solar collectors could be constructed to transmit unlimited solar energy to Earth, sun screens could reduce the effects of climate change on our planet, and even the elusive dream of a Moon base would be easily within our grasp. Asteroids are scary. They are responsible for at least one mass extinction event on our world and may be responsible for thousands of deaths and injuries since – we all remember the shocking images and damage caused by the small meteor strike in Russia last year. While it is easy for us to cower from these seemingly unstoppable juggernauts, humanity has a history of turning its adversaries into allies and our threats into opportunities. Asteroids are just another one of these tamable beasts, waiting for the first brave pioneers to make use of their vast wealth. Although many NEOs are not metallic, asteroids with other compositions have a variety of uses.